The ancient parish comprises the townships of Llan (or Tre'rllan), Moelfre, Penyfed, Rhosymaenbrych, Disgarth, Llys Dinmael, Cefn Cymer and Ystradelog (or Nanthalog). There are references to a church on the site in the early thirteenth century. 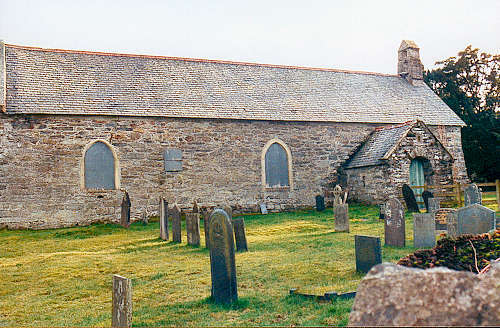 The church was rebuilt in 1747, and was restored in 1873/1874. It was closed some years ago, and services for the parish are now conducted in St. Catherine's, Dinmael. For family history information about the churches and parish, visit the GENUKI Llangwm page.